Happy Back Support Pillow Discounts Apply ! The Happy Back Support Cushion is the perfect back support pillow for pregnancy-related back pain and needed nursing support. Made with Memory Foam, the pillow molds to your back making it YOUR perfect pillow. The pillow promotes natural spine alignment, relieving stress and preventing muscle spasms in your lower back. 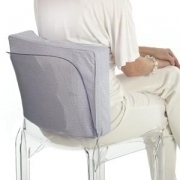 It also promotes good posture, and supports the natural inward curve of your lower back. Middle layer is made of Necessary Firm Foam for extra SUPPORT. Bottom layer is made of Memory Foam for super COMFORT. Pillow has a breathable inner cover that wipes clean easily and a removable outer cover included! *This item will ship separately from other items in your order via UPS ground. Please allow 5 - 7 days for order processing on this item.